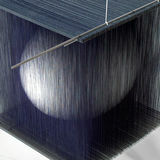 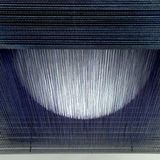 This sculpture consists of 12400 white silk threads, partially screen-printed dark blue, weighed down by steel bars. 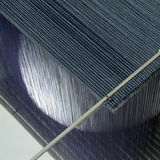 Each thread carries a ‘grain of weight’, little more than 1 gram. 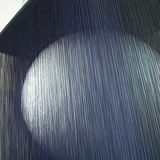 This adds up to a total of 2½ stones. 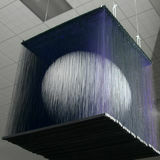 The threads form a dark cube in which a white sphere seems to be floating. 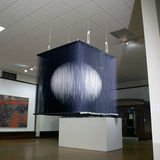 It is luminous and non-transparent and looks so solid that people try to touch the mirage.